You can only eat this dish right now. Well, you can most likely eat it a week from now, and you could have eaten it a week or two ago. But this salad will taste good for only a short amount of time. That’s a lot of pressure. Summer dishes have an urgency to them. If you mark the passing of time by the produce calendar, they can incite anxiety. But that’s what makes them special. That they are fleeting makes them worthwhile. A winter supermarket tomato may look like a tomato but it doesn’t eat like one; it’s not a tomato. An in-season one is sweet as a ripe peach and its walls are just as tasty as its guts. Winter storebought herbs are brittle and musty. Summer herbs are tender and supple and so fragrant you can’t quite get their smell out of your kitchen, even if they’re stashed in the fridge. The allure of these short-lived flavors provides me with the energy to make a balanced meal at the end of exhausting, sun-soaked days. If I don’t eat all the things now, I won’t get my fill. It will turn cold and I will stare at mountains of just kale and beets for months. Like that tomato, or those herbs, a summer cucumber is exceptional. Shipped-from-who-knows-where cucumbers are just limp, seedy sticks of water. Why do people eat them? 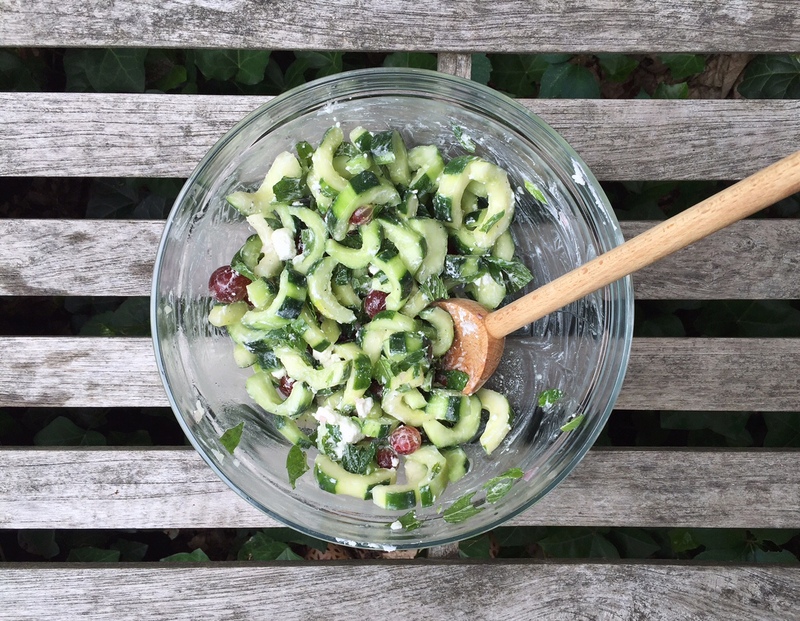 A summer cucumber is a #1 Salad Stunna. It has a flavor profile that the causal muncher can miss: a clean sweetness, lemony citrus notes. It can carry a whole dish, as it does here. Finally, gooseberries are one of the most limited-time-only treats, along with asparagus, garlic scapes, and strawberries (RIP). These tart-sweet fruits are unlike any other and are sold in these parts for maybe a month. 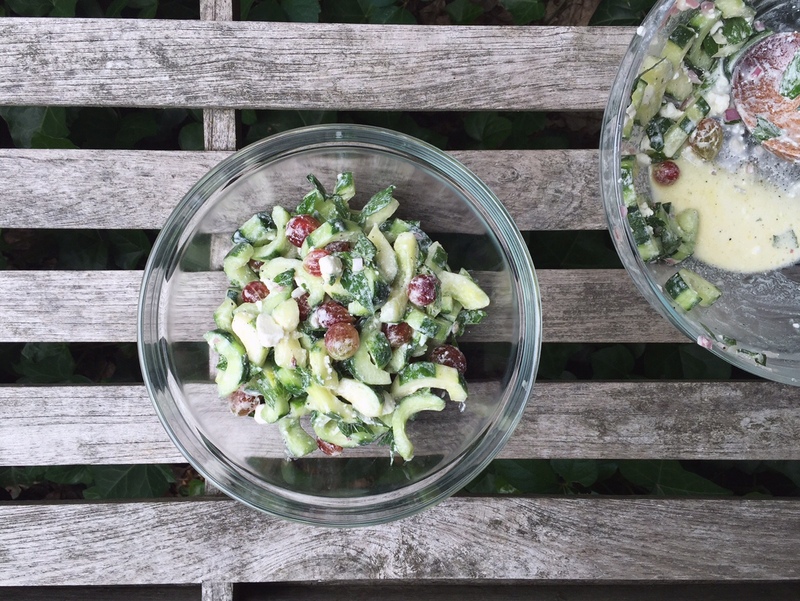 They make an intriguing pair with cucumbers in this salad. They’re tart enough (depending on the color you use) to make perfect sense in a savory dish, yet they’re sweet, musky, and almost wine-y enough to contrast with the salty and sheep-y cheese and the reckless tears of mint leaves and squeezes of lemon. They’re irreplaceable; a berry or other fruit won’t do. 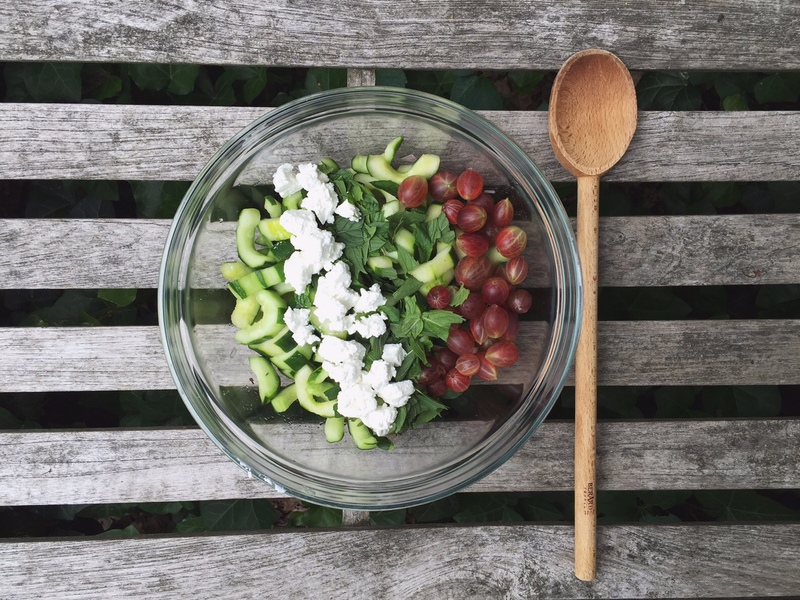 Each summer salad you eat should feel irreplaceable—a way to capture the joy of right now. A salad isn’t just a salad. Add this to your roster. You’ll appreciate cucumbers for their flavor and ability to carry a dish; you’ll appreciate gooseberries for their surprising pops of bold flavor; you’ll appreciate fresh mint for its true flavor and tender leaves. You’ll be so very July 30th. I “striped” the cucumbers. Some people don’t like the cucumber skins, but summer cucumbers are too special and I like the textural contrast and appearance. You can completely peel the skin or leave it completely intact. The more purple the gooseberries are, the sweeter and more floral-tasting they will be. Green gooseberries are sour. These guys were half-and-half. I used my favorite feta, Bulgarian, which is fairly creamy. If you use a creamy feta (French is even creamier), it will become part of the dressing almost when you toss it, with larger pieces also remaining. But this isn’t necessary: A firm Greek feta works fine too, though. To be most efficient, prepare the other ingredients while the cucumbers are draining/chilling. Toss cucumbers with 1 teaspoon kosher salt in large bowl. Transfer cucumbers to colander and set colander over now-empty large bowl. 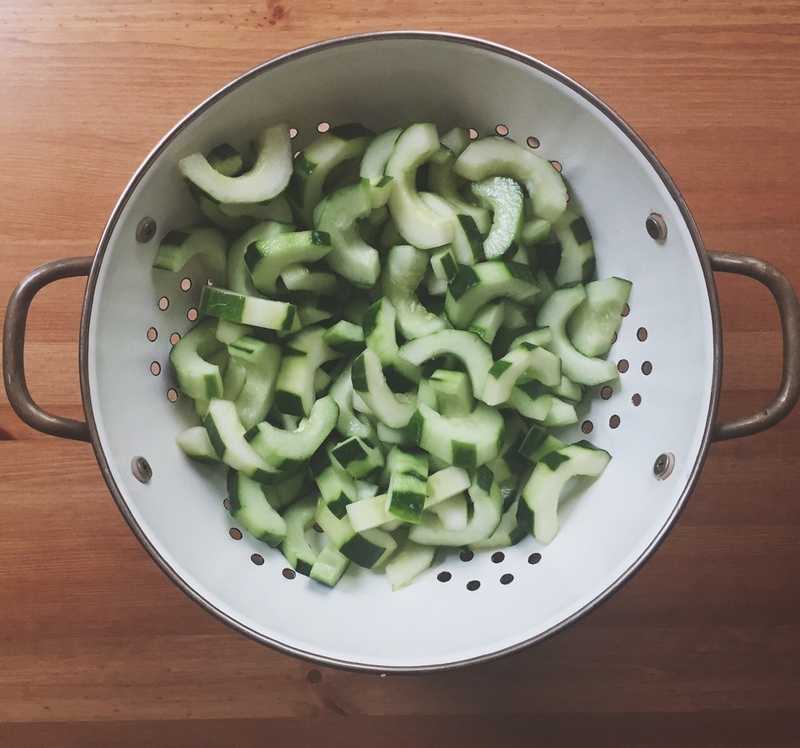 Let cucumbers drain, stirring once every 10 minutes, for 30 minutes. Press on cucumbers, then rinse under cold running water. Transfer cucumber to platter lined with double layer of paper towels. Cover cucumbers with double layer of paper towels, press on towels, and transfer to refrigerator for 10 minutes (you can stack cucumbers between layers of paper towels if necessary). Rinse and dry bowl. Meanwhile, whisk lemon juice, oil, shallot, and honey together in now-empty large bowl. 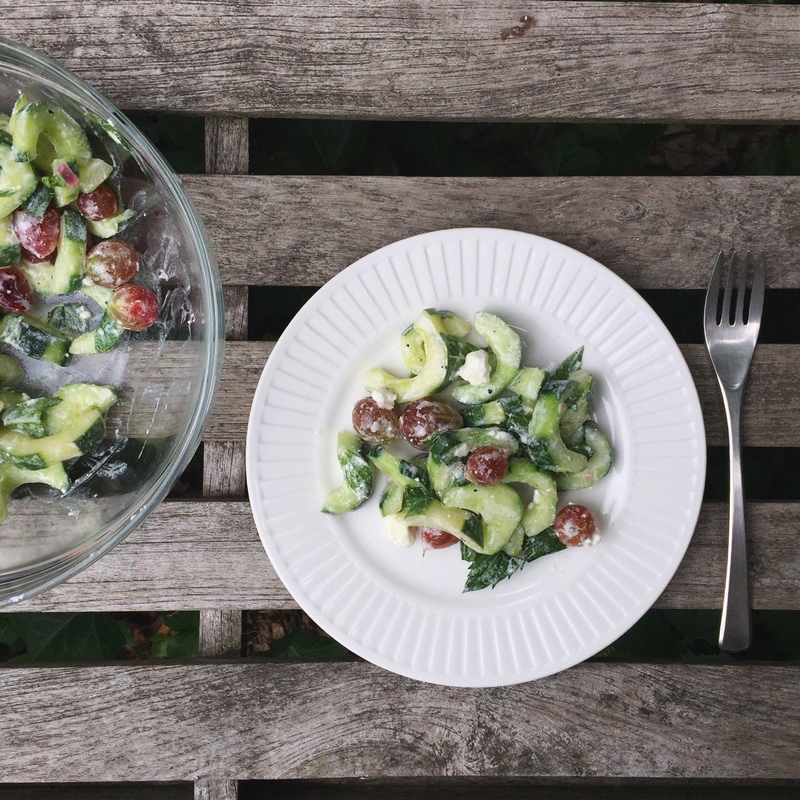 Add cucumbers, gooseberries, feta, and mint and toss with dressing to combine. I love your embodiment of the “sense of urgency”! Isn’t it stressful when you go to the market and everything you want to eat is In Season Right Now? I’ve been making my way from strawberries to cherries, apricots to peaches here in Paris. If I can find gooseberries (rare around here) I’ll try this very soon! Hi, Mimi! I don’t think they’ll pack the acidity needed to balance the salad as intended, but I’d be curious to know how it turns out. If you use them, you may taste to see if you want to add another tablespoon of lemon juice. If you can get currants (I’m guessing no), those would work; thin slices of raw rhubarb (though hard to find this late) would be nice; or maybe even dried unsweetened cherries (the sour kind). But the easiest thing is probably to use the mix-in of your choice like grapes and taste to see if you want more lemon juice. Cheers! Hey, Amanda. I love mint with blueberry and a spiralized salad would be so fun (I’m a big fan of this cucumber noodle recipe)! You might want to taste before serving to see if you need to add an extra tablespoon of lemon juice to make up for the acidity added by the gooseberries.